We will propose the concept of progressions to comprehensively cover the factorial on the set of natural cadenced. In this context, it is necessary to propose new notations hopelessly and new methods to facilitate applications and encompass this whole concept. Before that, we agreed that all the manifestations of logical truth must coexist with the simple matematic, but mostly get away from the confusion. Thus it is not preferable to new notations for what is already established. 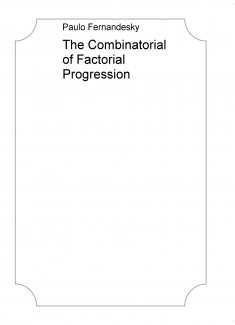 Thus we present the formulas for solving factorial progressions having as main focus the division operation that is relatively parallel multiplication.